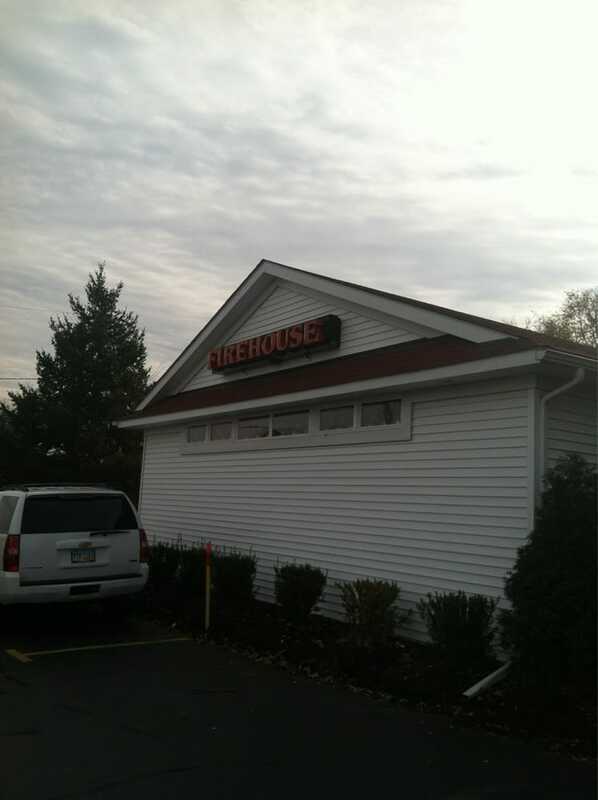 The fish fry at Firehouse Grille and Pub in Willoughby Hills was listed as one of Cleveland Magazine’s Fish Fry We Love. 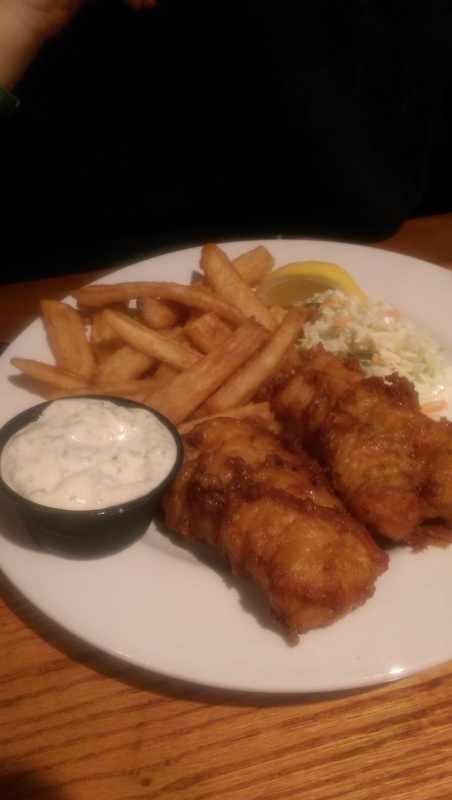 It features Icelandic cod battered in Great Lakes’ Dortmunder Gold or broiled ($11.99 for the regular dinner portion and $12.99 for the all-you-can-eat Friday special) and is served with two sides. They had me at Icelandic cod, and I knew I needed to come here for one of our Lenten fish fries. That wasn’t and was a mistake. It wasn’t a mistake because the fish fry is delicious; however, it was a mistake because I could have come here at any time during the year for their AYCE Friday special. In fact, I can’t even eat more than one piece of fish and some cole slaw and fries before tapping out, so just ordering it off the menu on, say, a Monday would also work. This place is crazy on Fridays during Lent. I was told that you need to call on Monday or Tuesday to get a reservation for Friday and by Wednesday they are booked. You can still get in to have dinner, but you are going to wait. I had a group going, but decided to cancel it because of the wait. A couple of us went anyway and ended up waiting for 40 minutes (after being quoted 30 minutes). 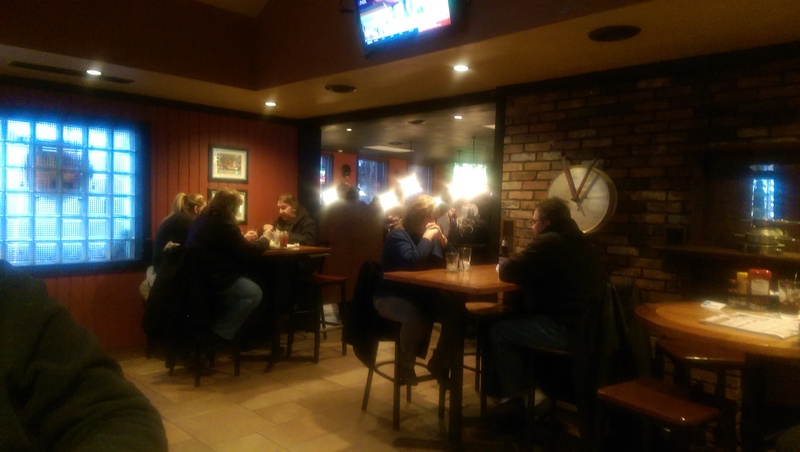 The place is tucked away in amidst about four different restaurants, so parking was seriously lacking. I lucked out and got a spot near the door without realizing the nondescript building in back was in fact The Firehouse Grille. Another complaint is that patrons do not comply with state law of smoking 25 feet from the building. Instead they smoke under the roof, right outside the doors, and the cigarette smoke wafts in while you are standing or sitting in the hallway waiting for a table. Sure, it’s a bar with pool tables, but if you have asthma or an allergy you might want to actually sit at the bar instead of stand/sit in the hallway. Once we were shown to our table the friendly server greeted us and got our drink orders. Once he brought our drinks we gave him our orders. I wish I hadn’t looked at the menu, because I decided not to get the fish fry when I saw a sandwich called The Crabby Boy. 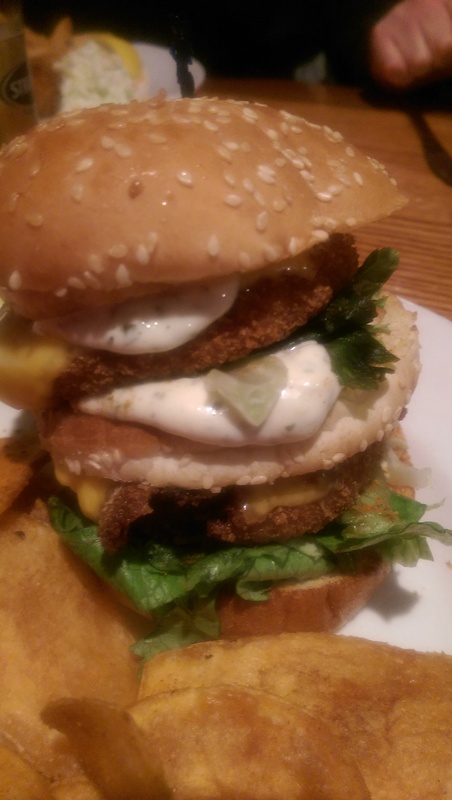 It is basically a Big Mac made of crab cakes instead of burger patties. Specifically, two crab cakes in a triple sesame seed bun, topped with American cheese, shredded lettuce and Cajun tartar sauce. And yes, it is on the regular menu. It is served with spicy homemade chips. The chips were a bit too spicy for me that day, as my stomach was feeling a little dodgy. The sandwich itself was definitely a unique sandwich. The crab cakes were soft so it didn’t hold up real well once I cut it in half, but it was a fun Lent alternative. I also ordered the clam chowder. 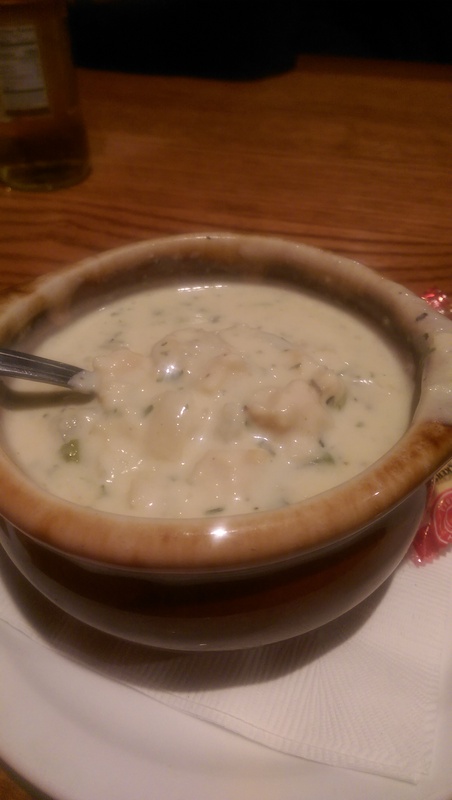 It is a New England clam chowder, and wow, was it tasty. It was chock full of clams and chunks of potatoes and celery. Definitely homemade. 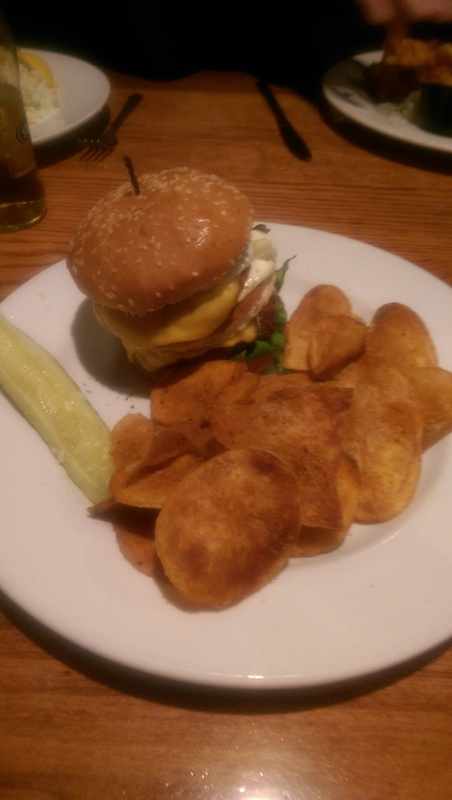 It had a buttery taste to it with some serious dill undertones. I would go back for the chowder alone! My friends loved the fish and chips there. They are hard-core fish and chips fans (one is from England), so that is high praise. They are going to be back for it. The fish was flaky and perfectly fried – not too greasy. The french fries/chips were nice and thick like they serve in England. They even got to douse them in malt vinegar, which I have to say really added to the flavor. They were less enthused about the cole slaw, which they found to be a little too sweet. But they will definitely be regulars at the Firehouse from now on. We’ll be back – just not on a Friday during Lent. 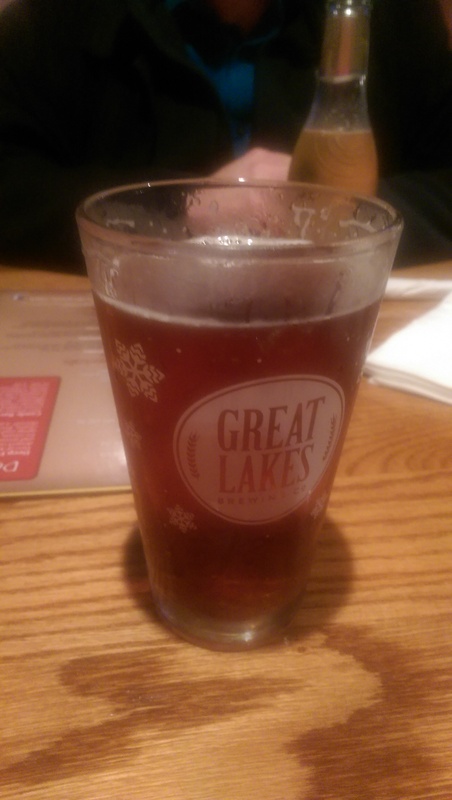 I got to enjoy my meal with cold beer on tap (a red ale) and they enjoyed some Strongbow Cider, which you can’t do at church fish fries. It was a good night.